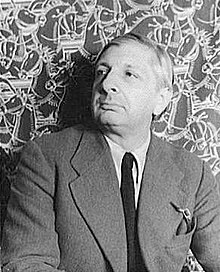 Giorgio de Chirico (Italian: [ˈdʒordʒo deˈkiːriko]; 10 July 1888 – 20 November 1978) was an Italian artist and writer born in Greece. In the years before World War I, he founded the scuola metafisica art movement, which profoundly influenced the surrealists. His most well-known works often feature Roman arcades, long shadows, mannequins, trains, and illogical perspective. His imagery reflects his affinity for the philosophy of Nietzsche and for the mythology of his birthplace. After 1919, he became a critic of modern art, studied traditional painting techniques, and worked in a neoclassical or neo-Baroque style, while frequently revisiting the metaphysical themes of his earlier work. De Chirico was born in Volos, Greece, as the eldest son of Gemma Cervetto and Evaristo de Chirico. His mother was Genoese-Greek (likely born in Smyrna) and his father a Sicilian barone from a family of remote Greek origin (the Kyriko or Chirico was a family of Greek origin that moved from Rhodes to Palermo in 1523, together with other 4000 Greek-Catholic families). De Chirico's family was in Greece at the time of his birth because his father, engineer, was in charge of the construction of a railroad. Beginning in 1900, de Chirico studied drawing and painting at Athens Polytechnic—mainly under the guidance of the Greek painters Georgios Roilos and Georgios Jakobides. After Evaristo de Chirico's death in 1905, the family relocated in 1906 to Germany, after first visiting Florence. 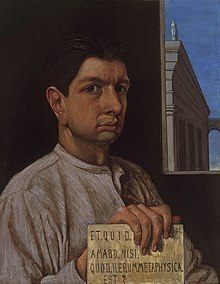 De Chirico entered the Academy of Fine Arts in Munich, where he studied under Gabriel von Hackl and Carl von Marr and read the writings of the philosophers Nietzsche, Arthur Schopenhauer and Otto Weininger. There, he also studied the works of Arnold Böcklin and Max Klinger. The style of his earliest paintings, such as The Dying Centaur (1909), shows the influence of Böcklin. He returned to Italy in the summer of 1909 and spent six months in Milan. By 1910, he was beginning to paint in a simpler style of flat, anonymous surfaces. At the beginning of 1910, he moved to Florence where he painted the first of his 'Metaphysical Town Square' series, The Enigma of an Autumn Afternoon, after the revelation he felt in Piazza Santa Croce. He also painted The Enigma of the Oracle while in Florence. In July 1911 he spent a few days in Turin on his way to Paris. De Chirico was profoundly moved by what he called the 'metaphysical aspect' of Turin, especially the architecture of its archways and piazzas. The paintings de Chirico produced between 1909 and 1919, his metaphysical period, are characterized by haunted, brooding moods evoked by their images. At the start of this period, his subjects were motionless cityscapes inspired by the bright daylight of Mediterranean cities, but gradually he turned his attention to studies of cluttered storerooms, sometimes inhabited by mannequin-like hybrid figures. De Chirico's conception of Metaphysical art was strongly influenced by his reading of Nietzsche, whose style of writing fascinated de Chirico with its suggestions of unseen auguries beneath the appearance of things. 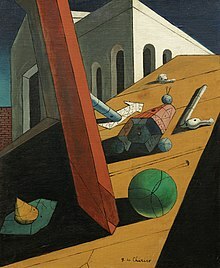 De Chirico found inspiration in the unexpected sensations that familiar places or things sometimes produced in him: In a manuscript of 1909 he wrote of the "host of strange, unknown and solitary things that can be translated into painting ... What is required above all is a pronounced sensitivity." Metaphysical art combined everyday reality with mythology, and evoked inexplicable moods of nostalgia, tense expectation, and estrangement. The picture space often featured illogical, contradictory, and drastically receding perspectives. Among de Chirico's most frequent motifs were arcades, of which he wrote: "The Roman arcade is fate ... its voice speaks in riddles which are filled with a peculiarly Roman poetry". De Chirico moved to Paris in July 1911, where he joined his brother Andrea. Through his brother he met Pierre Laprade, a member of the jury at the Salon d'Automne, where he exhibited three of his works: Enigma of the Oracle, Enigma of an Afternoon and Self-Portrait. During 1913 he exhibited paintings at the Salon des Indépendants and Salon d’Automne; his work was noticed by Pablo Picasso and Guillaume Apollinaire, and he sold his first painting, The Red Tower. His time in Paris also resulted in the production of Chirico's Ariadne. In 1914, through Apollinaire, he met the art dealer Paul Guillaume, with whom he signed a contract for his artistic output. At the outbreak of World War I, he returned to Italy. Upon his arrival in May 1915, he enlisted in the army, but he was considered unfit for work and assigned to the hospital at Ferrara. The shop windows of that town inspired a series of paintings that feature biscuits, maps, and geometric constructions in indoor settings. In Ferrara he met with Carlo Carrà and together they founded the pittura metafisica movement. He continued to paint, and in 1918, he transferred to Rome. Starting from 1918, his work was exhibited extensively in Europe. In November 1919, de Chirico published an article in Valori plastici entitled "The Return of Craftsmanship", in which he advocated a return to traditional methods and iconography. This article heralded an abrupt change in his artistic orientation, as he adopted a classicizing manner inspired by such old masters as Raphael and Signorelli, and became part of the post-war return to order in the arts. He became an outspoken opponent of modern art. In the early 1920s, the Surrealist writer André Breton discovered one of de Chirico's metaphysical paintings on display in Guillaume's Paris gallery, and was enthralled. Numerous young artists who were similarly affected by de Chirico's imagery became the core of the Paris Surrealist group centered around Breton. In 1924 de Chirico visited Paris and was accepted into the group, although the surrealists were severely critical of his post-metaphysical work. De Chirico met and married his first wife, the Russian ballerina Raissa Gurievich in 1925, and together they moved to Paris. His relationship with the Surrealists grew increasingly contentious, as they publicly disparaged his new work; by 1926 he had come to regard them as "cretinous and hostile". They soon parted ways in acrimony. In 1928 he held his first exhibition in New York City and shortly afterwards, London. He wrote essays on art and other subjects, and in 1929 published a novel entitled Hebdomeros, the Metaphysician. Also in 1929, he made stage designs for Sergei Diaghilev. In 1930, de Chirico met his second wife, Isabella Pakszwer Far, a Russian, with whom he would remain for the rest of his life. Together they moved to Italy in 1932 and to the US in 1936, finally settling in Rome in 1944. In 1948 he bought a house near the Spanish Steps; now the Giorgio de Chirico House Museum, a museum dedicated to his work. In 1939, he adopted a neo-Baroque style influenced by Rubens. De Chirico's later paintings never received the same critical praise as did those from his metaphysical period. He resented this, as he thought his later work was better and more mature. He nevertheless produced backdated "self-forgeries" both to profit from his earlier success, and as an act of revenge—retribution for the critical preference for his early work. He also denounced many paintings attributed to him in public and private collections as forgeries. In 1945, he published his memoirs. He remained extremely prolific even as he approached his 90th year. During the 1960s, Massimiliano Fuksas worked in his atelier. 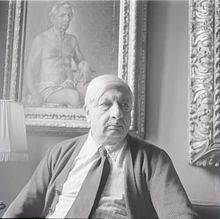 In 1974 de Chirico was elected to the French Académie des Beaux-Arts. He died in Rome on 20 November 1978. His brother, Andrea de Chirico, who became famous under the name Alberto Savinio, was also a writer and a painter. De Chirico's best-known works are the paintings of his metaphysical period. In them he developed a repertoire of motifs—empty arcades, towers, elongated shadows, mannequins, and trains among others—that he arranged to create "images of forlornness and emptiness" that paradoxically also convey a feeling of "power and freedom". According to Sanford Schwartz, de Chirico—whose father was a railroad engineer—painted images that suggest "the way you take in buildings and vistas from the perspective of a train window. His towers, walls, and plazas seem to flash by, and you are made to feel the power that comes from seeing things that way: you feel you know them more intimately than the people do who live with them day by day." could condense voluminous feeling through metaphor and association ... In The Joy of Return, 1915, de Chirico's train has once more entered the city ... a bright ball of vapor hovers directly above its smokestack. Perhaps it comes from the train and is near us. Or possibly it is a cloud on the horizon, lit by the sun that never penetrates the buildings, in the last electric blue silence of dusk. It contracts the near and the far, enchanting one's sense of space. Early de Chiricos are full of such effects. Et quid amabo nisi quod aenigma est? ("What shall I love if not the enigma? ")—this question, inscribed by the young artist on his self-portrait in 1911, is their subtext. In this, he resembles his more representational American contemporary, Edward Hopper: their pictures' low sunlight, their deep and often irrational shadows, their empty walkways and portentous silences creating an enigmatic visual poetry. De Chirico won praise for his work almost immediately from the writer Guillaume Apollinaire, who helped to introduce his work to the later Surrealists. De Chirico strongly influenced the Surrealist movement: Yves Tanguy wrote how one day in 1922 he saw one of de Chirico's paintings in an art dealer's window, and was so impressed by it he resolved on the spot to become an artist—although he had never even held a brush. Other Surrealists who acknowledged de Chirico's influence include Max Ernst, Salvador Dalí, and René Magritte, who described his first sighting of de Chirico's The Song of Love as "one of the most moving moments of my life: my eyes saw thought for the first time." 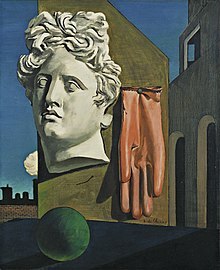 Other artists as diverse as Giorgio Morandi, Carlo Carrà, Paul Delvaux, Carel Willink, Harue Koga and Philip Guston were influenced by de Chirico. De Chirico's style has influenced several filmmakers, particularly in the 1950s through 1970s. The visual style of the French animated film Le Roi et l'oiseau, by Paul Grimault and Jacques Prévert, was influenced by de Chirico's work, primarily via Tanguy, a friend of Prévert. The visual style of Valerio Zurlini's film The Desert of the Tartars (1976) was influenced by de Chirico's work. Michelangelo Antonioni, the Italian film director, also said he was influenced by de Chirico. Some comparison can be made to the long takes in Antonioni's films from the 1960s, in which the camera continues to linger on desolate cityscapes populated by a few distant figures, or none at all, in the absence of the film's protagonists. Writers who have appreciated de Chirico include John Ashbery, who has called Hebdomeros "probably ... the finest [major work of Surrealist fiction]." 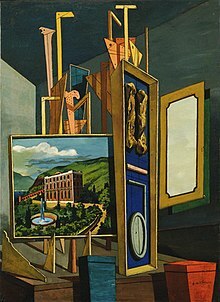 Several of Sylvia Plath's poems are influenced by de Chirico. In his book Blizzard of One Mark Strand included a poetic diptych called "Two de Chiricos": "The Philosopher's Conquest" and "The Disquieting Muses". Gabriele Tinti composed three poems inspired by de Chirico's paintings: The Nostalgia of the Poet (1914), The Uncertainty of the Poet (1913), and Ariadne (1913), works in the Peggy Guggenheim Collection, the Tate, and the Metropolitan Museum of Art, respectively. The poems were read by actor Burt Young at the Met in 2016. 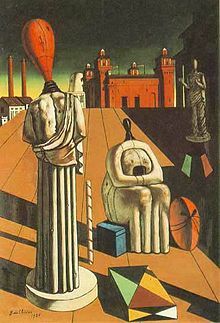 The box art for Fumito Ueda's PlayStation 2 game Ico sold in Japan and Europe was strongly influenced by de Chirico. 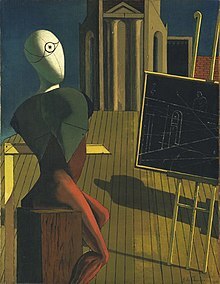 The cover art of New Order's single "Thieves Like Us" is based on de Chirico's painting The Evil Genius of a King. 1958: Member of the Royal Academy of Science, Letters and Fine Arts of Belgium. ^ Union List of Artist Names Online, retrieved 15 February 2019. ^ a b Rivosecchi, Valerio (1987). "De Chirico, Giorgio". Enciclopedia Italiana (in Italian). Retrieved 17 February 2019. ^ Aa.Vv. Giorgio De Chirico. L'uomo, l'artista, il polemico: Guida alle interviste 1938-1978 (in Italian). Roma: Gangemi. p. 64. ISBN 978-8849224320. ^ "Figure 1: The map depicts in dotted lines the successive moves of de..." ResearchGate. ^ Aa.Vv. Giorgio De Chirico. L'uomo, l'artista, il polemico: Guida alle interviste 1938-1978 (in Italian). Roma: Gangemi. p. 49. ISBN 978-8849224320. ^ a b Gale, Matthew (2003, January 01). "De Chirico, Giorgio". Grove Art Online. Ed. ^ Holzhey 2005, p. 14. ^ Holzhey 2005, p. 15. ^ Holzhey 2005, p. 25. ^ Holzhey 2005, pp. 15–18. ^ Holzhey 2005, p. 46. ^ Metken, G. (1981). Realismus: zwischen Revolution und Reaktion, 1919-1939 : [Ausstellung im Centre Georges Pompidou, Paris, 17. Dezember 1980-20. April 1981 : Ausstellung in der Staatlichen Kunsthalle, Berlin, 16. Mai-28. Juni 1981. München: Prestel-Verlag. pp. 83–84. ISBN 3791305409. ^ Holzhey 2005, p. 62. ^ Holzhey 2005, p. 67. ^ a b Holzhey 2005, p. 94. ^ "Giorgio De Chirico". www.artchive.com. ^ Schwartz 1990, p. 29. ^ Schwartz 1990, p. 22. ^ Schwartz 1990, pp. 23-24. ^ Hughes, Robert, essay from Nothing If Not Critical: Selected Essays on Art and Artists, 1982, seen at artchive.com, retrieved June 19, 2013. ^ Marler, Regina (2018-10-25). "'Every Time I Look at It I Feel Ill'". ISSN 0028-7504. Retrieved 2019-01-22. ^ Rolando Caputo. "Literary cineastes: the Italian novel and the cinema". Peter E. Bondanella & Andrea Ciccarelli (eds.). The Cambridge Companion to the Italian Novel. Cambridge: Cambridge University Press, 2003. Pp. 182–196. ^ "The Nostalgia of the Poet – a project by Gabriele Tinti - Fondazione Giorgio e Isa de Chirico". www.fondazionedechirico.org. ^ Letteratura, Rai. "Gabriele Tinti: La nostalgia del poeta, Omaggio a Giorgio de Chirico". Il portale sulla letteratura di Rai Cultura. ^ Letteratura, Rai. "Gabriele Tinti: La nostalgia del poeta, Omaggio a Giorgio De Chirico (2)". Il portale sulla letteratura di Rai Cultura. ^ Letteratura, Rai. "Gabriele Tinti: La nostalgia del poeta, Omaggio a Giorgio De Chirico (2)". Il portale sulla letteratura di Rai Cultura (in Italian). Retrieved 2019-01-22. ^ Letteratura, Rai. "Gabriele Tinti: La nostalgia del poeta, Omaggio a Giorgio de Chirico". Il portale sulla letteratura di Rai Cultura (in Italian). Retrieved 2019-01-22. ^ "Readings". Gabriele Tinti. Retrieved 2019-01-22. ^ Mielke, James; Rybicki, Joe (2005-09-23). "A Giant in the Making". 1UP. Retrieved June 19, 2013. ^ "No more rules: graphic design and postmodernism". Choice Reviews Online. 41 (10): 41–5691–41–5691. 2004-06-01. doi:10.5860/choice.41-5691. ISSN 0009-4978. ^ "Giorgio de Chirico - Argonaut of the Soul". Film Festival World. 7 September 2010. Archived from the original on 3 June 2013. Retrieved 19 June 2013. Wikimedia Commons has media related to Giorgio de Chirico.